Cole and I went to see the The King's Speech with his mom with an AMC gift card that UJ sent us (Thanks UJ!). Since we were getting a freebie, I decided to stick with the theme and make some movie candy at home. Shh, don't tell the movie police. These homemade peanut butter cups are super easy and quite yummy. I actually am more of a milk chocolate person, but the dark chocolate in these cups certainly make them taste like something a little more gourmet and special. Prepare a miniature muffin tin with mini cupcake liners. Combine chocolate and shortening in microwave safe bowl. Temper or melt chocolate by heating in microwave on 15-30 second increments, stirring frequently until melted and shiny. Place 1 teaspoon of melted chocolate in each liner with a small spoon or pastry brush, spreading evenly and bringing the chocolate coating up around the sides of the liner without going over. Refrigerate cups until chocolate is firm. While the cups are in the fridge, stir together peanut butter, butter, sugar, crumbs, and salt. You can melt this mixture in a sauce pan over low heat on the stove or in the microwave so it's easier to add to the cups. Add 1-2 teaspoons of peanut butter paste into all mini cupcake liners, pressing down gently to make sure the filling is packed in well and the cups are about 3/4 full. Place in fridge to firm up, for about 20 minutes. Finally, add 1 teaspoon of melted chocolate to each cup, smoothing chocolate with back of spoon until the peanut butter filling of each cup is entirely covered. 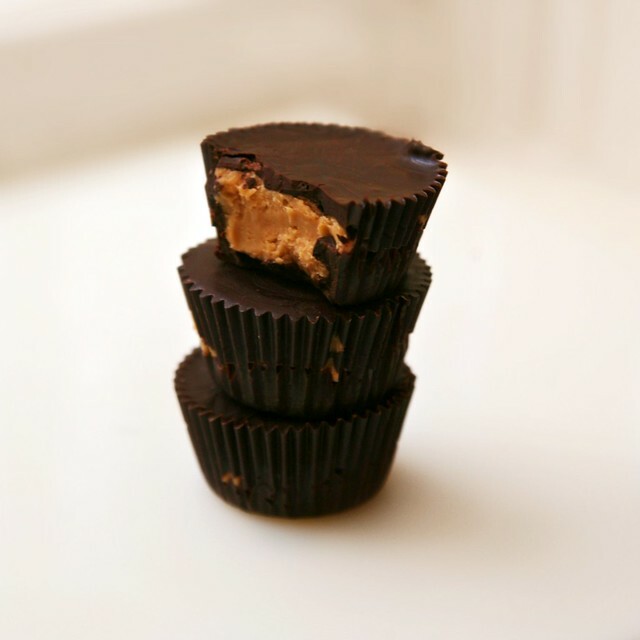 Place peanut butter cups back in the fridge until firm or at least 1 hour.